Wellington Airport’s new multi-level car park and transport hub is nearing completion, with the last panels on the exterior cladding of the building now fitted. The design – created by architecture firm Archaus – took inspiration from natural colors found in the landscape, coastal environment, hills and sky so the building blended into the airport’s surrounding area. The colored panels alternate gradually across the façade, creating a pixelated landscape on each side of the building. The panels are made from perforated aluminum and provide natural ventilation. The nine-story structure is now fully enclosed and the final phase of an internal fit-out is now underway before the hub is opened to passengers and visitors later this year. The multi-level car park will add over 1,000 parking spaces and features a parking guidance system and electric charging stations for electric vehicles. The ground floor transport hub has an expanded area for bus and shuttle pick-up and drop-off. The multi-level parking lot also frees up space for a larger free pick-up and drop-off area, as well as additional entry and exit gates and an expanded area for bike storage. Outside of the multi-level car park and transport hub a ride-sharing zone, taxi stands, a rental car zone, valet and a range of other parking products will be available for travelers. John Howarth, general manager for infrastructure and planning, Wellington Airport, said, “We wanted to ensure that the facade was as sympathetic to its surroundings as possible. 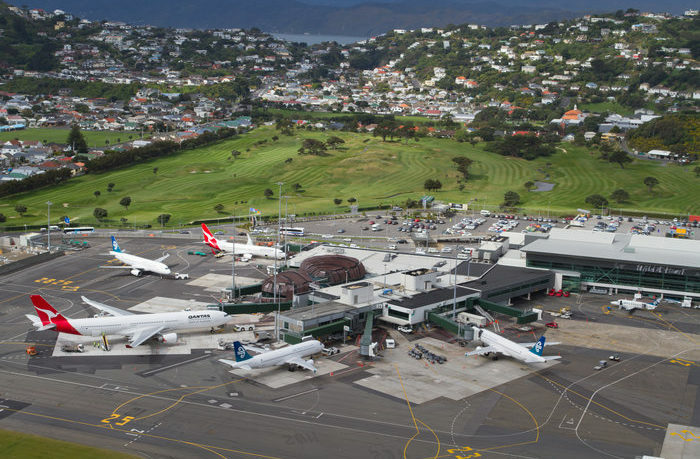 “Wellington has the benefit of having an airport that is very close to the central business district, but that does mean a balance between growth needs and being part of our adjoining suburbs.